(1) School will undertake screening and assessments to determine the right placement of an applicant. (2) Students entering Years 1 - 12 will be asked to complete a placement test. 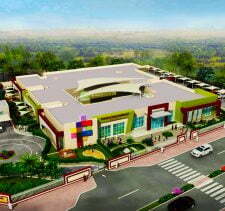 (4) Decisions on admissions will be based on age, academic, social and emotional development. 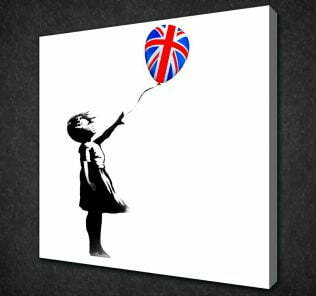 •	Outstanding value for a GEMS, English National Curriculum founded, British school. A serious, very well-conceived school that, in its balance of facility provision, specialist focus and GEMS founding, is punching well above the expectations you might expect of its fees. Phased launch notwithstanding, we believe this is a school worth searching out, particularly for parents seeking a GEMS Tier 1 education to a budget. 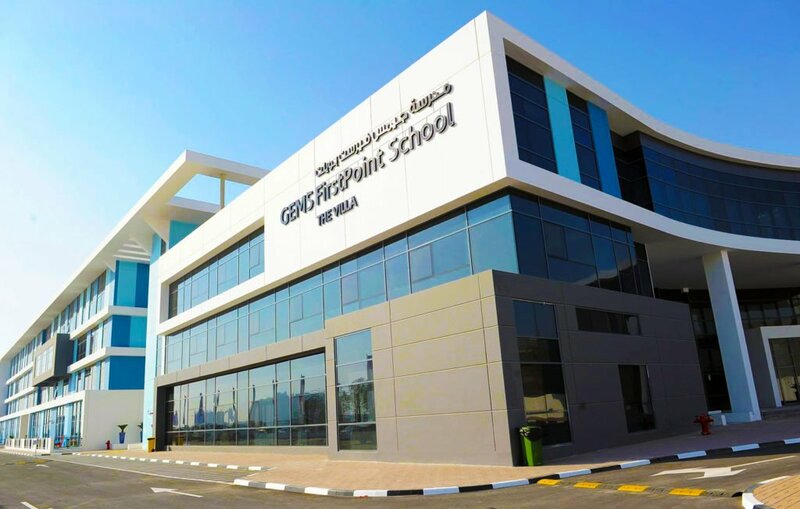 GEMS FirstPoint is a very interesting school in a multitude of areas – and it is also, importantly, a very good one. So what sets it apart. 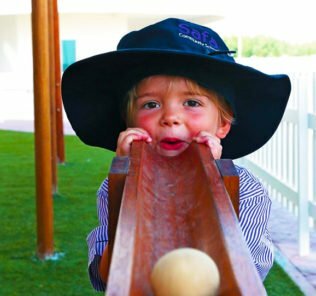 There are two defining features that standout and which we believe will be of particular interest to prospective parents. When you average the fees over thirteen years, the school offers a considerable value proposition for parents, offering a premium education but at a level that (in places, just) touches the borders of lesser mid-tier fees. Note the average quoted above is for years KG-9, however even when recalculated up to Year 12 the average is 49,700 AED. 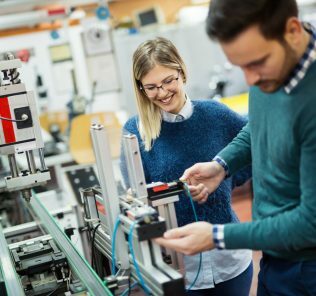 FirstPoint has also been set up as a specialist technology school with very significant investment in the full breadth of technology curricular and required infrastructure across facilities, labs, faculty and equipment. GEMS is making the point that FirstPoint is not a compromise school. This does not mean either that GEMS is a school only for children with an interest in technology – not at all; rather the school is set up so that it can offer a very broad spectrum of subject provision to cater for the individual gifts of children, however their gifts develop over time. If a child requires it, everything a child could possibly need to meet their potential is in place. It is also worth noting that FirstPoint sets itself apart in its provision of specialist teachers from Year 1. This is brought to life in its emphasis on enterprise, computing and technology. All children access specialist computing and programming lessons from a young age, and, for example, gain access to trained technology teachers and the spectrum of facilities provision including an impressive robotics and electronics laboratory. 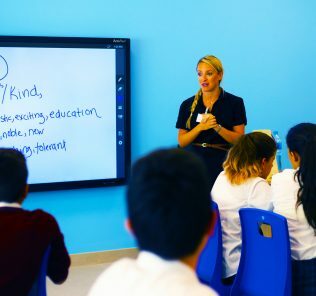 This at least matches the provision of one alternative Tier 1 ultra-premium we have reviewed which is aiming to establish itself as the benchmark technology school in the Emirates – and with very considerably higher fees. 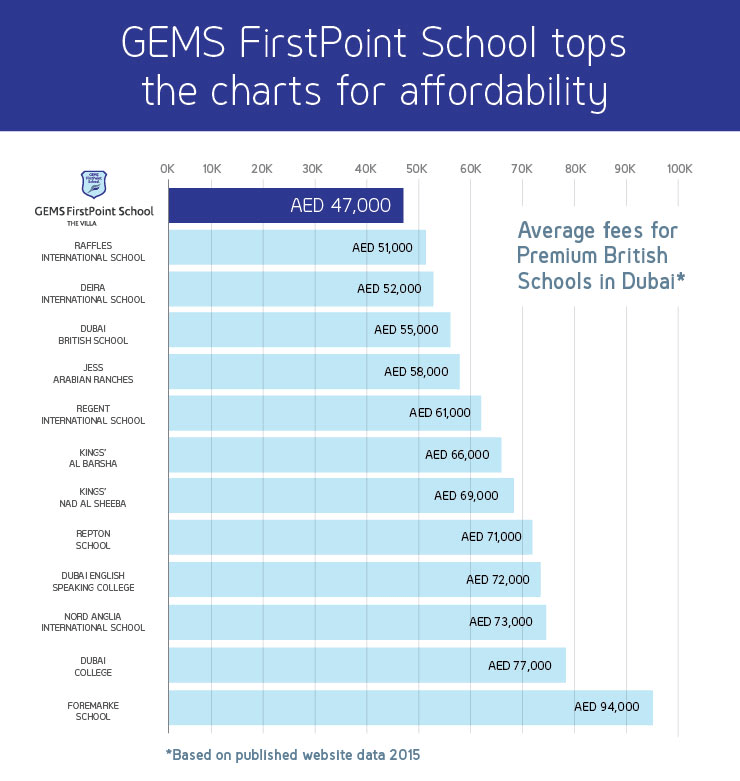 With fees running between 38,000 AED at FS phases and 65,000 AED in Years 12 and 13, the fees are still going to stretch many parents, some considerably. But, this notwithstanding, we believe that for those parents that can push themselves, FirstPoint, in its Tier 1 balance of curriculum, facilities and faculty, offers the best value proposition for a GEMS Tier 1 British education to date. 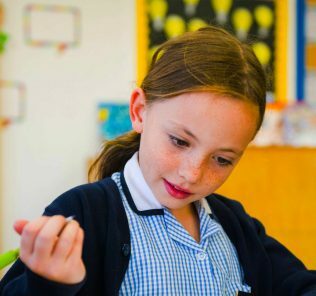 Opening in 2014, FirstPoint is set on a 241,000 square foot, 5 and half acre site in phased launch to deliver an all-through KG to Year 13 English National Curriculum based education to around 850 students. Eventual capacity will be between 1500 and 3000 students – scale, in key part, explaining how GEMS has managed to deliver a Tier 1 at this fee level. 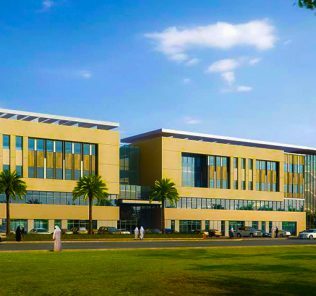 The school’s location in The Villa, Dubailand, gives it close proximity to Dubai Academic City, Silicon Oasis, Dubai Outlet Mall, the Remraam and Mudoncommunities and easy commuting accessibility off the Al Ain Road. Mr Sharples continues to build on, and strengthen this approach with, first, the development of close cross-curricular links between Mathematics, Science and IT, placing this at the core of curriculum delivery and, second, a focus on programming for all students from year 1. Enterprise classrooms have been further extended to include Graphics, Textiles, Electronics, Resistant Materials, Food Technology and a fully-equipped Woodwork workshop. 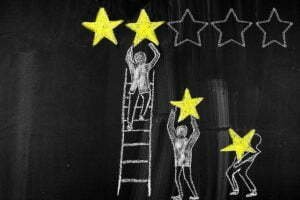 Our sister site, WhichSchoolAdvisor.com notes, however, that Mr Sharples biggest impact has been on building much stronger links with parents and the broader FirstPoint community. This includes new physical access to the Villa project via a walk way, enabling students to cycle to school, but also less obviously, but arguably much more significant, his empowering of a new Parent Council. Parents will have a genuine, direct say in policy decisions (such as operating hours) – and will lead think tanks on a range of subjects. 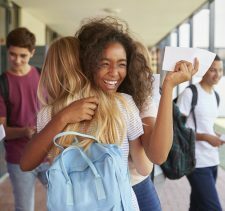 “The engagement with parents is clearly working – in the most recent GEMS parent survey, GEMS Firstpoint averaged a score of 8.8/10: the highest scoring school in the GEMS network.” WhichSchoolAdvisor.com Visit. 2016. On this note, we also wish to highlight exceptionally good school transparency and information provision for parents at the school, and those prospective parents considering the school for the education of their child(ren). 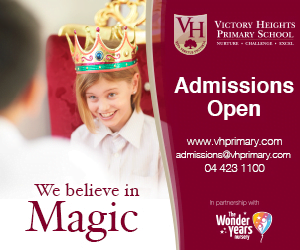 This offers a level of information significantly above those of other GEMS schools, allowing parents to bury down into the curriculum, as well as to truly gain an understanding of school life through regular, informative weekly newsletters and further, open, publication of all communications with parents. We particularly like the inclusion of a plethora of supportive quotations from existing parents within the prospectus. 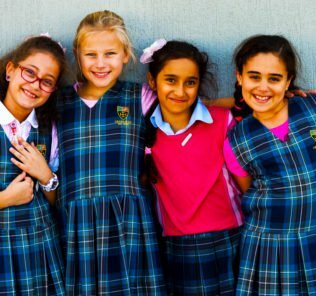 We hope that this level of school transparency and openness will extend to full, comprehensive publication of examinations data at IGCSE and A Level, together with the added value data to place that in the clear context of an impressively inclusive school, as FirstPoint beds in its provision. With that in place we would rate the communication by the school as outstanding. Facilities are Tier 1 – and exceed those prospective parents should expect at this fee level. 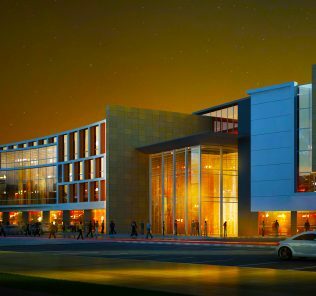 They include Science Laboratories – Biology, Chemistry and Physics; Electronics and Robotics Laboratories; ICT Discovery Spaces; separate Primary and Secondary Libraries; Art & Design Studios; Food Technology Catering Suite; an Electronics Workshop; Resistant Materials Workshop; Graphics Studio; Textiles Studio; 500-seat landmark auditorium with professional theatre facilities and acoustic soundproofing; specialist Drama Space & Black Box Theatre; Music Technology Suite; 7 Practice Rooms; an Ensemble Room; Mac Lab; Woodwork and Science Workshops; and, a Recording Studio. 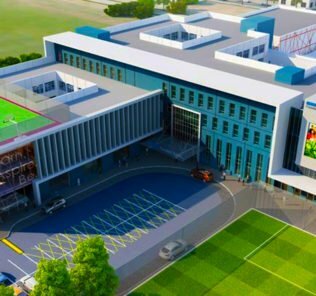 Sporting facilities include excellent outdoor pitches and track and field provision as well as an outdoor shaded 25m Swimming Pool; Learners Pool; six court sports halls; and, a Climbing Wall. Core sports include Swimming, Cricket, Football, Basketball and Rounders. 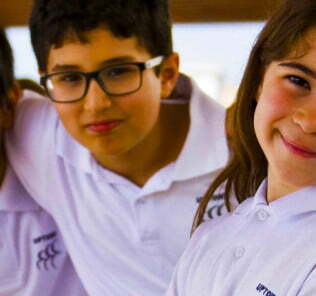 ECAs and enrichment at GEMS FirstPoint School is Tier 1 – and extensive. 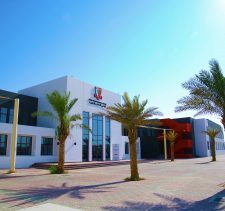 It includes Visual and Performing Arts Clubs; GEMS Music Academy; Choir; Saxophone, Clarinet, Violin, Guitar, Drums and Piano lessons; Art & Crafts Club; International Day; Summer Camp; Environmental Awareness Club; Debating Club; National School Sports Quiz; Young Enterprise Club; Photography, Chess, Drama, Arts, Environmental Club; Support classes in Arabic and English; accredited skills-based courses); E-sports Football Academy; Clark Francis Tennis Academy; Ballet; Kung Fu; Dodgeball Club; Basketball; Swim Squad, Aquatics; Rounders; Dance Club; Theatre and Drama Club; Fashion, Design and Illustration Club; Ukulele Club; Brain Gym; Jewellery Club; Art Doodle Club; Badminton; Cricket; Islamic Projects; a Science Club; Arabic Magazines; DT Enterprise; Quran and Tajweed; iPad Photography Club; Dutch Language classes; Puzzle and Games Club; Film Review Club; planned Guest Speaker Programme for Sixth Formers; and, an Eco Club. FirstPoint also adopts the classic UK independent House structure, with students assigned places in one of four houses: Air (yellow), Earth (green), Fire (red) or Water (blue). 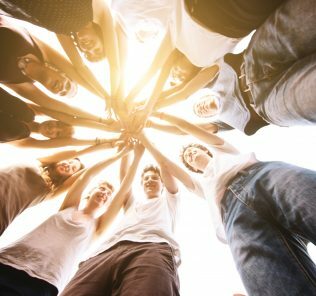 The house system is used very effectively for building the sense of community between faculty and students as a balance to the stretch of the curriculum, with “rewards” won across the spectrum of school activities. 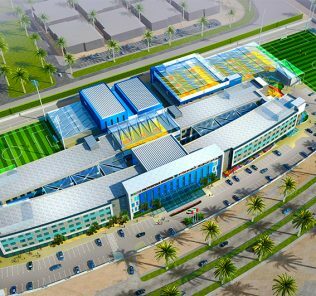 We would add, that, in its balance of breadth and quality of facilities, specialist technology provision, GEMS foundations and fee structure, this is a school offering a Tier 1 education well beyond legitimate expectation. 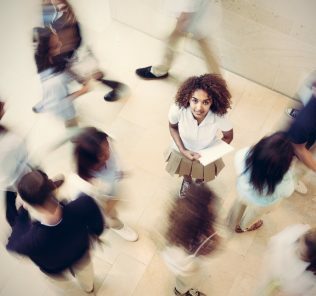 Prospective parents should note that, as a school in phased launch, scoring is based on projections drawn from independent whichschooladvisor data and metrics, benchmarking against sector provision, weighting of GEMS infrastructure, school information and feedback from students, parents and teachers.